Have you ever had a time in your life that everything was just coming up roses? A span of time that makes you want to buy a lottery ticket because you are sure you’ll win since everything else in your world is going according to plan? Did that every scare the crap out of you? If everything is going so right, something must inevitably crash and burn right before your very eyes to bring you back to the harsh, cruel light of reality. But what if it doesn’t? What if you choose not to worry about it? What if you just savor the moment as if it were a decadent piece of chocolate melting on your tongue? To give you all a little insight, my 2013 has been going exceptionally well for being only a quarter of the way through the year. I was chosen for a promotion at work in the midst of a hiring freeze, I started dating a man I’m actually really excited about, and I’m still the favorite auntie to my four munchkins. Without getting too sappy or boastful, I am incredibly happy with the place I am in life and am not freaking out about anything—quite unusual for me. And I’ve got to say, it feels really good to just be. I overheard my boyfriend say to someone the other day, “I’m dating this wonderful girl and I’m just waiting for her to pull the rug out from under me.” He was kidding and just saying it to bust my chops, but it got me thinking: with everything going so wonderfully, what’s the catch? Sure, I got a promotion in a time when employee furloughs are being discussed as a means to fix the country’s financial problems. Yes, I’m in a great relationship with someone who has known me for ten years (talk about a strong foundation!) and who lives 500 miles away. I could spend hours of my life finding out how each piece of the puzzle fits together, but for once, I’m not concerning myself with trying to figure it all out. Maybe things are just supposed to be “really good” for no other reason than “really good” feels really awesome. The thing is, dwelling on what could go wrong and worrying about what the future holds really robs a person of the present. A man can get wrapped up in everything he has yet to accomplish in his life or a woman can stress about ever meeting a suitable mate to have a family with. These people can be so consumed with “what if?” that they don’t stop to pay attention to “what is.” If you’re constantly waiting for the other shoe to drop, you could be missing the cha-cha that everyone else is dancing to. After all, the other shoe may never drop. Maybe it’s all the inspiring quotes I’ve been finding on Pinterest, but there certainly is something to be said about being present and living in the moment. Six months ago, I never would have believed that I could be so la-di-da about my life. I’ve always been the one who likes to have a plan and know exactly where I’m headed at any given point. I would have been horrified at the thought of “going with the flow” and taking things day-by-day, but I would have missed out on the freedom that comes with an unknown future. There will always be mental planning and wondering, but I’m trying not to let it distract me from the here and now. I’m allowing myself to savor the moments and just be excited about them without the anxiety that often surrounds the unknown. Focusing on the now is where it’s at. After all, tomorrow is not a guarantee. My thought was to say something like, “Just do what comes naturally….” Sounds simple enough…but I am one of those people who usually waits on the shoe to drop (but I’m working on it…). I’m so glad that you have been able to enjoy and live in and love each moment lately! What a fantastic journey! Little people always ask the simplest questions with the most difficult answers. 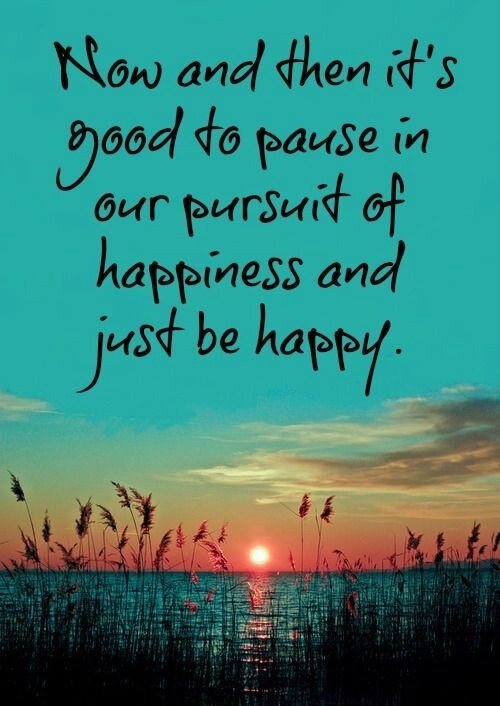 It’s hard to just “be happy” if “doing what comes naturally” is waiting for the other shoe to drop. I guess it all comes down to what feels right in the moment for a particular person. Letting go and not worrying is a very hard thing for people to do (myself included), but the feelings you get when you focus on the now are so much better than the anguish that comes with over-thinking. Keep working on it, Karin and before you know it, you’ll come to an amazing place that you never expected. I know I did. I’m reblogging this from my friend, the lovely Jessica at Defining Wonderland, because she sums up the feeling I’ve been having with regard to my own blissful state. Trust the good feelings. Thanks for the reblog, Laura! “Trust the good feelings.” I couldn’t have said it better myself. You said it! “After all, tomorrow is not a guarantee.” Every day is a gift so embrace what is good in your life and move forward. I love reading a good news post and this is definitely one of those! Love this Jessica, beautifully said! Exactly how I am feeling at the moment as well. Must be in the air. It certainly must be in the air, Steph. You, Laura, and I are definitely on the same wavelength these days, but the good thing is, we are enjoying the heck out of it and that’s really all that matters. Don’t question it. Relax and just bask in the moment. Sometimes we all just need to enjoy the good parts of life that are thrown at us. Great advice, Phil. It’s all about basking in the moment and not questioning it. Questioning only hurts the moment. Glad you’re doing so well, Jessica. As you said, there’s no trick or catch. the biggest risk is to miss the good times worrying for bad times that don’t even exist.